To enter one of Raf Simons’ show spaces is always a real treat. 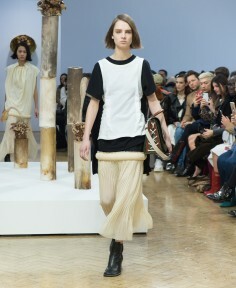 A portal into a surreal world, the Belgian designer knows only too well the power of realising an holistic universe. Here, inside the former American Stock Exchange building, this ability to create atmosphere was brilliantly showcased. 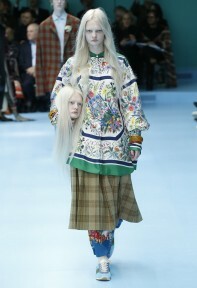 Transformed into a madcap vision of the diverse American landscape, the set was more reminiscent of a Universal Studios ride than a catwalk space. Knocked-together barns (like the one featured in the brand’s recent Willy Vanderperre-photographed campaign) were erected and adorned in Andy Warhol photographs, while pompoms and Sterling Ruby sculptures hung from scaffolding, and a layer of popcorn – about a foot deep and 50,000 gallons of the stuff – covered the floor. As for the apocalyptic figures who walked these sweet ’n’ salty streets, they came dressed in a collection that mirrored the dichotomy of Raf’s words. 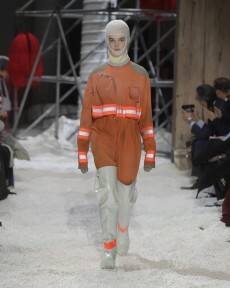 Heroes appeared in the form of firemen’s jackets for men and women, integrating the hi-vis, reflective stripes into cropped jackets, parkas and sherling, while Mylar survival blankets were reimagined as dresses and accessorised with hazmat boots and gloves to create space-age homages to our astronaut pioneers that looked both delicate and tough at once. 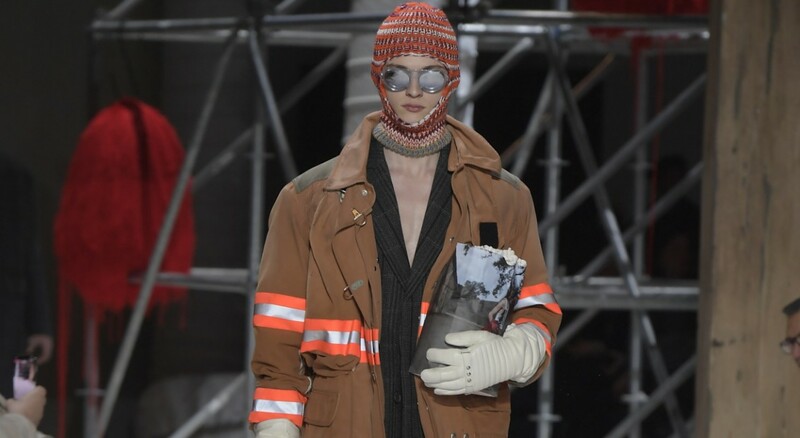 Elsewhere heavily layered knitwear featured Looney Tunes characters Roadrunner and Wile E. Coyote, lumberjack check jackets nodded towards those midwest settlers, and a number of prairie dresses, quilt shirts and patchwork pieces referenced rural America. 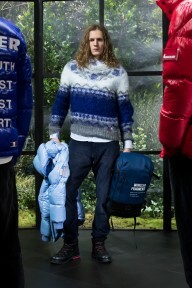 Many looks also came accessorised with hand-knitted balaclavas that were very Raf (pulling the wool over our eyes? A strong metaphor). The soundtrack offered its own meanings. 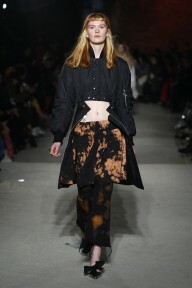 Created by Michel Gaubert and Ryan Aguilar, tracks segued from Simon & Garfunkel’s The Sound of Silence to The Mamas And The Papas’ California Somnolienta, while bursts of muffled bass tones interjected and David Bowie’s This Is Not America echoed from Raf’s first Calvin Klein collection. 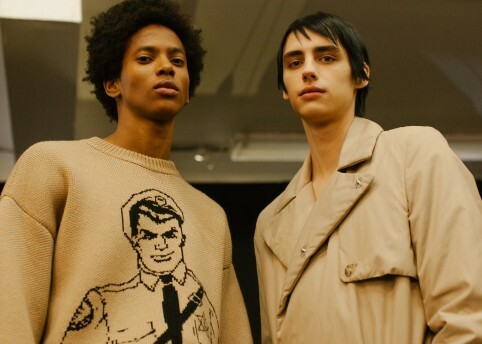 Now in his third season at Calvin Klein, Raf’s socio-political blender continues to whirl, celebrating the foundations of American culture, while simultaneously pulling them apart. 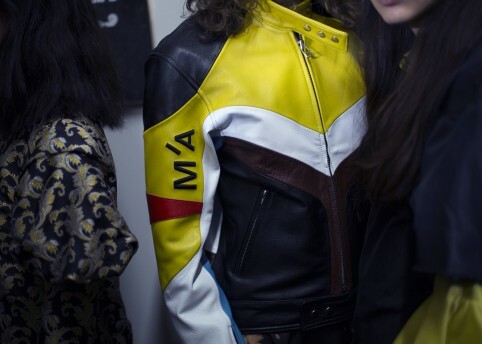 Here, the designer set the metaphorical mixer to maximum, building on the subversive themes of previous seasons while digging deeper into his adopted-home’s psyche. 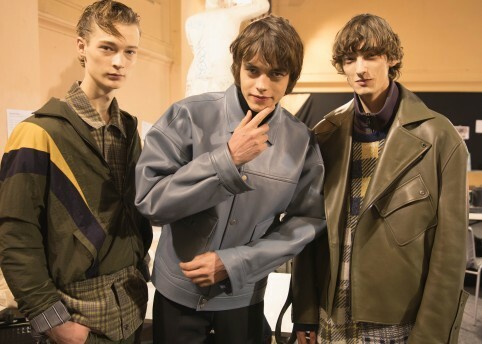 As models walked clinging onto Calvin Klein-branded bags of popcorn, you couldn’t help but consider the blurring of reality and fiction in recent years. In this world of fire and fury, when TV stars are our leaders, accusations are rebranded as fake news, and lies are becoming the norm, are we all just sat watching as the fires continue to blaze?